The other house of parliament is called the senate. Every state, Northern Territory and the Australian Capital elect 12 people to be their senators. 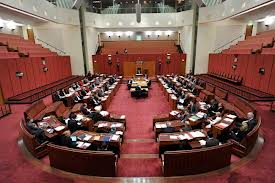 No matter the size of the state or territory, they have the same number of senators. The chamber of the parliament house where the senate meets is decorated in red. Like the house of representatives the government members sit in the seats on the left of the picture, and the opposition sit to the opposite of them. The curved part is for the small parties or the independence. In the main chair in the centre the president of the senate sits. The president of the senate is in charge of the meetings. Australia has three levels of law- making-often referred to three level's of governments-that provides the services they need. Local councils (also called shires or municipalities), across the nation. 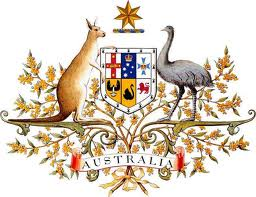 Australia has one federal parliament, six state and to territory parliaments, and local councils. Representatives are elected to federal and state or territory parliaments and local councils make laws ;the governments put these laws into action. The federal government has great national powers. Among other things the federal government takes care of laws in relation to defence, immigration, foreign affairs, trade, postal services and taxation. State or territory has power over to look over laws not covered by the federal government for e.g. hospitals, schools, police and housing services. The local powers of the councils are defined by then acts of parliament passed by state parliaments include responsibility for building regulations, local roads and pet control. All governments make money by taxes. Australia is divided in to areas called electorates. In each electorate there is a seat in the house of representatives. At the election the people who live in each electorate vote for a person who discusses ideas. The representatives becomes a member of the house of representatives for that seat. The party who have the most representatives in the house of representatives are the opposition and the leader of the party is called leader of the opposition. The chamber in the parliament house is where the representatives meet the room is decorated in green. The government sits on the left and the opposition faces them. The members of the smaller parties sit in the curved part, so does the members who don't belong in the party. Their called independents. The seats up high are called the gallery, people can watch from up there but they can't speak. Some people in the gallery are reporters for the newspapers, radios, or television. The big wooden chai in the middle of the room sits the speaker. The speaker is in charge of the meeting and makes sure everyone gets a turn to speak.